60 arab +25 rom + 15 p.a. A rare etching by French sculptor and designer Philippe Hiquilly. From the portfolio of 20 etchings choosen by Tristan Sauvage with text by Franco Russoli. Edited by Galleria Schwarz, Milano. 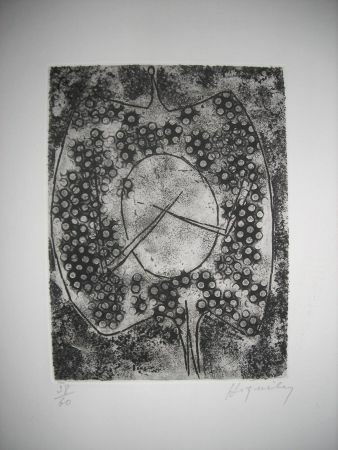 Prints by P. Alechinsky, M. Bat-Yosef, G. Dova, Farfa, G. Harloff, P. Hiquilly, T. Imai, J. J. Lebel, P. Martin, E. R. Matta, B. Munari, B. Parent, M. Persico, C. Peverelli, C. F. Reuterswaerd, K. Sato, M. W. Svanberg, Toyen, J. P. Vielfaure, J. Zimmermann.